Efficient and pathogen-specific antifungal agents are required to mitigate drug resistance problems. Here we present cationic small molecules that exhibit excellent microbial selectivity with minimal host toxicity. Unlike typical cationic polymers possessing molecular weight distributions, these compounds have an absolute molecular weight aiding in isolation and characterization. 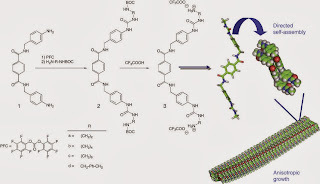 However, their specific molecular recognition motif (terephthalamide-bisurea) facilitates spontaneous supramolecular self-assembly manifesting in several polymer-like properties. Computational modelling of the terephthalamide-bisurea structures predicts zig-zag or bent arrangements where distal benzyl urea groups stabilize the high-aspect ratio aqueous supramolecular assemblies. These nanostructures are confirmed by transmission electron microscopy and atomic force microscopy. Antifungal activity against drug-sensitive and drug-resistant strains with in vitro and in vivo biocompatibility is observed. Additionally, despite repeated sub-lethal exposures, drug resistance is not induced. Comparison with clinically used amphotericin B shows similar antifungal behaviour without any significant toxicity in a C. albicansbiofilm-induced mouse keratitis model.